Using our oil and gas glossary, learn the definitions of industry terms such as acidizing, blowout preventer, hydraulic fracturing, and many more. This is not meant to be an exhaustive glossary, but contains many of the words used in the industry and on this website and is provided for your convenience. ACIDIZING – a technique used to increase the flow of oil and/or gas out of a well. Hydrochloric acid is pumped into the oil-bearing rock. The acid dissolves limestone in the producing zone which increases porosity thus the oil and/or gas can flow into the well bore with less restrictions. AMERICAN PETROLEUM INSTITUTE – national trade association that represents all aspects of America’s oil and natural gas industry. ASSESSMENT – activities not part of Initial Operations that the Managing Venturer deems necessary to further develop the Well subsequent to the drilling, testing and completion of the Well. BLOWOUT PREVENTER – a large, specially designed valve that is mounted on top of the well during the drilling and completion stages of operation. The operator can close this valve to stop the flow of oil or gas in case of emergency. BOTTOM HOLE PRESSURE – reservoir pressure at the bottom of the well. BRITISH THERMAL UNIT (BTU) – the amount of heat required to increase the temperature of a pint of water (which weights exactly 16 ounces) by one degree Fahrenheit. One cubit foot of natural gas produces approximately 1,000 BTUs, so 1,000 cubic feet of gas is comparable to 1 MBTU, which is intended to represent a thousand thousand BTUs. CASING – steel pipe that screws together and is lowered into the hole after drilling is complete. It is used to seal off fluids and keeps the hole from caving in. CASING POINT – point in time after a well has been drilled to its objective depth where the Operator must decide whether to commit additional dollars to “setting pipe” and attempt a completion or to abandon the well as non-commercial. CEMENT OR SET PIPE – a process whereby cement is pumped between the walls of the hole and outside of the casing. Upon hardening, the cement holds the pipe in place and prevents fluid movement in the hole. CEMENT SQUEEZE – or Squeeze Cementing is a “correction” process that is usually only necessary to correct a problem in the wellbore. A cement slurry is prepared and pumped down a wellbore to the problem area or squeeze target. The area is isolated, and pressure is applied from the surface to effectively force the slurry into all voids. CHOKE – a wellhead choke controls the surface pressure and production rate from a well. Chokes are usually selected so that fluctuations in the line pressure downstream of the choke have no effect on the production rate. This requires that flow through the choke be at critical flow conditions. Under critical flow conditions, the flow rate is a function of the upstream or tubing pressure only. For this condition to occur, the downstream pressure must be approximately 0.55 or less of the tubing pressure. CHRISTMAS TREE – an assembly of valves, spools, pressure gauges and chokes fitted to the wellhead of a completed well to control production. Christmas trees are available in a wide range of sizes and configurations, such as low- or high-pressure capacity and single- or multiple-completion capacity. COMMERCIAL WELL – a well that is capable of producing enough oil and gas to be economically viable to operate. COMPLETION – a general term referring to all activities necessary to put a well into production after it has been drilled to casing point. CONTAINMENT DIKE – a structure constructed around an oil tank to contain the oil in case the tank collapses or leaks. COOLERS – heat exchangers used to reduce gas and liquid wellstream temperatures to allow further processing and meet pipeline specifications. COST DEPLETION – the reduction in quantity of mineral deposits from estimated recoverable reserves percentage depletion. PERCENTAGE DEPLETION ALLOWANCE – a statutory allowance granted on taxable income from oil and gas by the Federal and most State Governments. DEPOSIT – an accumulation of oil, gas or other minerals that is capable of production. DEVELOPMENT PROSPECT – a project that extends production of a producing oil or gas field including drilling additional wells or enhancing production of current wells. DEVELOPMENTAL WELL – a well drilled to a known producing formation in an existing oil field. DISCOVERY WELL – an exploratory well that results in production from a previously unknown deposit. DOWN-HOLE PUMP – a fairly simple piece of equipment that has a plunger, pump barrel and two valves. The valves consist of a stationary valve at the bottom called the standing valve and a valve on the top called the traveling valve. The traveling valve, which is attached to the rods, opens and closes as the rods, with their up and down motion, force the plunger to travel up and down inside the pump barrel which creates the suction affect necessary to produce fluids. DRY HOLE – a Wellbore which is not capable of producing oil and/or gas in commercial quantities. A Well may qualify as a dry hole either before or after Completion. ELECTRIC LOG – an electrical survey made on uncased holes. A special tool is lowered into the hole that ejects an electrical current into the rock and records its resistance to the current. Geologists use the survey data to determine the nature of the rock and its contents. FLARE – it shows that there is natural gas entrained, or suspended within, the production stream in sufficient quantities to necessitate it being burned at the surface. FLOWBACK – the process of allowing fluids to flow from the well following a treatment, either in preparation for a subsequent phase of treatment or in preparation for cleanup and returning the well to production. FLOW LINE – a surface pipeline carrying oil, gas or water that connects the wellhead to a manifold or to production facilities, such as heater-treaters and separators. FLOW TEST – also called a well test is a period of time during which the production of the well is measured, either at the well head with portable well test equipment or in a production facility. FRAC FLUID – An abbreviation for fracturing fluid, a fluid injected into a well as part of a stimulation operation. Fracturing fluids for shale reservoirs usually contain water, proppant, and a small amount of nonaqueous fluids designed to reduce friction pressure while pumping the fluid into the wellbore. These fluids typically include gels, friction reducers, crosslinkers, breakers and surfactants; these additives are selected for their capability to improve the results of the stimulation operation and the productivity of the well. GAS WELL – a well that produces natural gas that is not associated with crude oil. GLYCOL UNIT – a unit used to remove minute water particles from natural gas if dehydration was not attained using separators. A glycol dehydrator unit is usually composed of an absorber and a reboiler. The wet gas enters at the bottom of the absorber. As the wet gas percolates upward, it releases its water into the glycol solution and dry gas is obtained at the top of the absorber. When the glycol solution becomes saturated with water, the glycol solution is pumped through a reboiler, also called a reconcentrator, which boils the glycol-water mixture and separates the glycol from the water. After separation, the glycol can return to the absorber to contact additional wet gas. GRAVITY OR API GRAVITY – American Petroleum Institute’s inverted scale for denoting the ‘lightness’ or ‘heaviness’ of crude oils and other liquid hydrocarbons. HELD BY PRODUCTION (HBP) – Acreage that has been drilled on; Leases are held in perpetuity as long as the wells continue to produce. HOT TAP – inserting a branch line into a pipeline or vessel which is still in operation. HYDRAULIC FRACTURING or FRAC’ING – the process of pumping fluids into a productive formation at high rates of injection to hydraulically break the rock. The “fractures” which are created in the rock act as flow channels for the oil and gas. INTANGIBLE DRILLING COSTS (IDC) – all cost incurred in drilling a well other than equipment or leasehold. INITIAL PRODUCTION (IP) – production from a well is generally broken down into three categories: a) Flush or Initial, b) Settled, C) Stripper. A well cannot maintain the flow rates it made during the first stages of its life. LOG – a systematic recording of data, such as a driller’s log, mud log, electrical well log, or radioactivity log. Many different logs are run in wells to obtain various characteristics of downhole formations. MOBILITY – The ratio of effective permeability to phase viscosity. The overall mobility is a sum of the individual phase viscosities. Well productivity is directly proportional to the product of the mobility and the layer thickness product. MUD – is the name given to drilling fluid which is mainly a mixture of water, or oil distillate, and ‘heavy’ minerals such as Bentonite or Barites. Mud is pumped into a well at densities calculated to provide a hydrostatic pressure sufficient to overcome downhole formation pressures. NET PRODUCTION – Amount of oil and/or gas a well generates that is owned and available for distribution after taxes, royalties, expenses are paid. NET REVENUE INTEREST (NRI) – percentage of production revenues allocated to the working interest after first deducting proceeds allocated to royalty and overriding interests. OFFSET WELL – well location adjoining another well site. OIL GRAVITY – the most widely used indicator of a crude oil’s worth to the producer. Normally, the price that a producer receives for his oil depends on its gravity, the less dense oils (higher gravity) being the most valuable. OIL & GAS LEASE – a contract between an oil operator and a mineral owner that gives the operator the right to drill for oil and gas on the property. OPEN ACREAGE – Acreage that has yet to be drilled on; Leases will expire on expiration date if drilling has not occurred. PACKER (Drilling) – a device that can be run into a wellbore with a smaller initial outside diameter that then expands externally to seal the wellbore. Packers employ flexible, elastomeric elements that expand. The two most common forms are the production or test packer and the inflatable packer. The expansion of the former may be accomplished by squeezing the elastomeric elements (somewhat doughnut shaped) between two plates, forcing the sides to bulge outward. The expansion of the latter is accomplished by pumping a fluid into a bladder, in much the same fashion as a balloon, but having more robust construction. Production or test packers may be set in cased holes and inflatable packers are used in open or cased holes. They may be run on wireline, pipe or coiled tubing. Some packers are designed to be removable, while others are permanent. Permanent packers are constructed of materials that are easy to drill or mill out. PACKER (Completion) – a downhole device used in almost every completion to isolate the annulus from the production conduit, enabling controlled production, injection or treatment. A typical packer assembly incorporates a means of securing the packer against the casing or liner wall, such as a slip arrangement, and a means of creating a reliable hydraulic seal to isolate the annulus, typically by means of an expandable elastomeric element. Packers are classified by application, setting method and possible retrievability. PAY or PAYZONE – A reservoir or portion of a reservoir that contains economically producible hydrocarbons according to geological data and/or electronic well logs. The term derives from the thought that it is capable of “paying” an income through production generated revenues. Pay may also be called pay sand or pay zone. The overall vertical interval found on logs in which pay sections occur is considered gross pay; the smaller portions of the gross pay that meet local criteria for pay (such as minimum porosity, permeability and hydrocarbon saturation) are considered net pay. PAYOUT – when the costs of drilling, producing, and operating have been recouped from the sale of oil and/or gas from a well. PERFORATE – to create holes in the casing or liner to achieve efficient communication between the reservoir and the wellbore. The characteristics and placement of the communication paths (perforations) can have significant influence on the productivity of the well. Therefore, a robust design and execution process should be followed to ensure efficient creation of the appropriate number, size and orientation of perforations. A perforating gun assembly with the appropriate configuration of shaped explosive charges and the means to verify or correlate the correct perforating depth can be deployed on wireline, tubing or coiled tubing. PERMEABILITY – measure of the resistance of rock to movement of fluids. Rocks may have holes in them (porosity), but if these holes do not connect, the permeability can be drastically reduced. PRESSURE – the force distributed over a surface, usually measured in pounds force per square inch, or psi, in US oilfield units. PRODUCTION FACILITY – equipment for the production of oil or gas located at a production site, including separation, treating and processing facilities, equipment and facilities used in support of production operations, landing areas, heliports, storage areas or tanks and dependent personnel accommodations. PRODUCTION TUBING – a wellbore tubular used to produce reservoir fluids. Production tubing is assembled with other completion components to make up the production string. PROVEN RESERVES – oil and gas reserves that have not been produced but have been located and have been determined recoverable. PUMPING UNIT – also called a pumpjack, oil horse, donkey pumper, horsehead pump, rocking horse, beam pump, dinosaur, grasshopper pump, Big Texan, thirsty bird or jack pump is the overground drive for a reciprocating piston pump in an oil well. It is used to mechanically lift liquid out of the well if not enough bottom hole pressure exists for the liquid to flow all the way to the surface. RECOVERY – the fraction of hydrocarbons that can or has been produced from a well, reservoir or field. RESERVOIR – rocks with the potential to store fluids such as oil and natural gas. REWORK – an attempt to increase production from an existing formation when it has fallen off substantially or ceased altogether. RIG – the machine used to drill a wellbore. In onshore operations, the rig includes virtually everything except living quarters. Major components of the rig include the mud tanks, the mud pumps, the derrick or mast, the drawworks, the rotary table or topdrive, the drillstring, the power generation equipment and auxiliary equipment. Offshore, the rig includes the same components as onshore, but not those of the vessel or drilling platform itself. RIG DOWN – to take apart equipment for storage and portability. Equipment typically must be disconnected from power sources, decoupled from pressurized systems, disassembled and moved off the rig floor or even off location. RIG UP – to make ready for use. Equipment must typically be moved onto the rig floor, assembled and connected to power sources or pressurized piping systems. SALT WATER DISPOSAL WELL – oftentimes, the salt water produced during oil production is pumped back into a formation that is deep enough not to pollute shallow water sands. Many wells that are no longer commercial are converted to salt water disposal wells. SEPARATION – the process of separating liquid and gas hydrocarbons from water. This is typically accomplished in a pressure vessel at the surface, but newer technologies allow separation to occur in the wellbore under certain conditions. SKID – a simple steel frame on which separate pieces of equipment are mounted into a single modular system to facilitate easy movement, hauling and/or storage. STANDING VALVE – in a subsurface sucker-rod pump, a valve that permits flow up the tubing to fill the pump-barrel chamber while preventing downward flow. 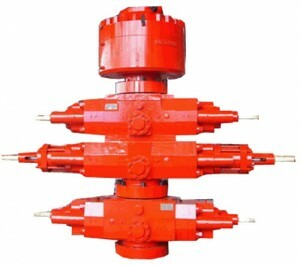 STUFFING BOX – prevents oil from escaping from a well, while also diverting it into a side outlet that is connected to the flow line leading to the oil and gas separator or to the field storage tank. SUCKER ROD – a steel rod that is used to make up the mechanical assembly between the surface and downhole components of a rod pumping system. Sucker rods are 25 to 30 feet long and threaded at each end to enable the downhole components to be run and retrieved easily. SURFACE PIPE – pipe which is set with cement through the shallow water sands to avoid polluting the water and keep the sand from caving in while drilling a well. SWAB TEST – swabbing can be defined as pulling a full-diameter tool from the wellbore; this pulling action is similar to that of a plunger in a syringe, and it initiates fluid flow into the wellbore. On occasion, oil or gas wells may not flow fluid to the surface on completion. When this occurs, a swabbing unit is run to remove the hydrostatic column of fluid in the wellbore and allow the well to kick off and flow. SWABBING – the process to remove liquids from the production zone of a gas or oil well. TANK – a metal or plastic vessel used to store or measure a liquid. The three types of tanks in an oil field are drilling, production and storage tanks. TANK BATTERY – a group of tanks at a well site used to store oil prior to sale to a transportation company. TESTING – a series of tests are run on a completed well to estimate the daily deliverability, payout, and reserves. TIE-IN – the action of connecting one pipeline to another or to equipment. Pipeline tie-in commonly describes the connection itself. Also known as tie-back. TOTAL DEPTH – the depth of the bottom of the well. Usually, it is the depth where drilling has stopped. TRAVELING VALVE – in a subsurface sucker-rod pump, the valve that closes the barrel chamber allowing the trapped fluid to be lifted in the upstroke of the pump. This valve is similar in configuration to the standing valve. TUBING – small diameter pipe that is installed in the casing. Tubing increases the viscosity of fluid thus a well’s flow capabilities. TUBING ANCHOR CATCHER (TAC) – a device used to anchor the tubing string to the casing at a desired depth and maintain tension in the tubing string during the pumping unit’s constant up-and-down motion. TUBING PRESSURE – pressure on the tubing in a well, as measured at the wellhead. TURNKEY CONTRACT – a contract in which an operator agrees to furnish all labor and materials necessary to drill a well to a certain depth or stage of completion for a specified sum of money. The operator or contractor assumes all of the responsibility and risks involved in completing the operation. VISCOSITY – the resistance of fluid to flow. High viscosity fluids will not flow as easily as low viscosity fluids. WELLBORE – the drilled hole or borehole, including the openhole or uncased portion of the well. Borehole may refer to the inside diameter of the wellbore wall, the rock face that bounds the drilled hole. WELLHEAD – the surface termination of a wellbore that incorporates facilities for installing casing hangers during the well construction phase. The wellhead also incorporates a means of hanging the production tubing and installing the Christmas tree and surface flow-control facilities in preparation for the production phase of the well. WILDCAT – a well drilled in an area where no oil or gas production exists. WIRELINE – a cabling technology used by operators to lower equipment or measurement devices into the well for the purposes of well intervention, reservoir evaluation, and pipe recovery. WORKING INTEREST – a working interest in an oil or gas property is burdened with the cost of development and operation of the property, such as the responsibility to share expenses of drilling completed or operating oil and gas property, Determines percentage share of ownership of gross production.